Chang’E’s husband was Hou Yi, the legendary archer whole shot down nine scorching suns, leaving only one in the sky, saving the earth and its people from suffering. 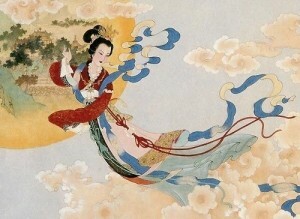 In gratitude, Hou Yi was granted the elixir of immortality by the Goddess of the West. Choosing to wait until he had finished his enjoyment on earth before transcending to immortality, he gave the bottle to his wife to keep safe. Unlike her husband, Chang’E, was impatient for immortality and one day, whilst Hou Yi was out, she opened the bottle and swallowed its entire content (enough for them both). Slowly she began to float, up and up towards the sky, floating up past heaven, until she eventually settled on the moon, where she was condemned for eternity to her cold and lonely palace. Every year, on the day his wife flew off, Hou Yi would look up at the moon and offer up Chang’E’s favourite fruits. There are many version of this legend. Another popular variation is that a disciple of Hou Yi’s tried to force Chang’E to give him the exlixir, and in order for it not to fall in the wrong hands, she took the whole bottle. 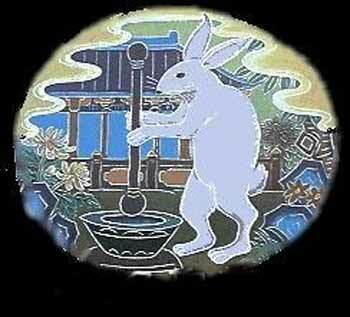 Yutu is often portrayed as jade rabbit wielding mortar and pestle, making medicines and elixirs. Some say that it was an original spirit of the moon, some say that it was once a god but was banished to the post of Chang’Es companion for misbehavior, others say that Yutu was the offspring of a pair of thousand-year-old celestial rabbits, who took pity on Chang’E and sent their daughter to keep her company. These legend are ancient, but they are retold again and again in cartoons, children’s picture books, films and passed on orally from generation to generation. Last year, as I attended a Mid-Autumn dinner with the chairman of London’s Chinatown Artspace, Christine Lau, she told me that when she was young, young women still prayed to 月姑, or “Aunty Moon”（an affectionate Cantonese term for the Moon Goddess, genuinely believing that she would grant them their wishes. Most Chinese people in the Mainland, would have had a rather odd perspective on the moon. 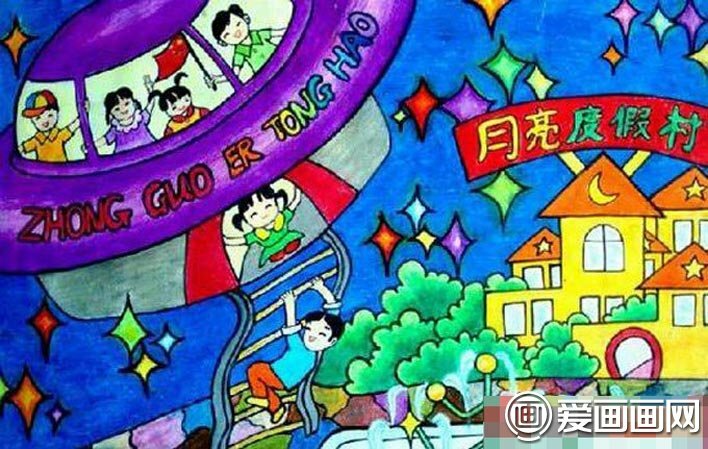 When most of the world was transfixed by the adventures into space of Neil Armstrong, Buzz Aldrin and Michael Collins, China had just begun a decade long, nation-wide, political movement that led to massive cultural destruction and civilizational regression. During the Cultural Revolution, the country was completely closed from the rest of the world, and the moon landing would have passed China by, being heard of by a select few, and seen by fewer still. Whilst, as the country caught up, and in many cases overtook the rest of the world, we learned of the exploration, but it had never really sunk in, the way a live audience would have undersood it. 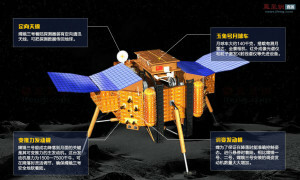 This is why, when China launched its lunar exploration programme (CLEP) in 2007, bearing its first lunar orbiter, with the goal of gathering 3D images of the lunar surface and info on the chemical makeup of the moon, it would make a far greater impact to the Chinese than to any other nation. The orbiter’s name, was Chang’E 1. In 2013, Chang’E 3 made the first soft moon landing since 1976. Her payload, a lunar rover, was aptly named Yutu. As Chang’E 3 touched down on Mare Imbrium, a previously unexplored area of the moon, those ethereal shadows began to take more concrete forms in the Chinese imagination, from goddess, rabbit and cinnamon tree to craters, crystals and mineral aggregates. Info gathered by Yutu has revealed a more complex lunar history than previously guessed by scientific community, including multi-layered terrain and signs indicating a lot more volcanic and explosive activity. What was most important for me though, is that people throughout China, whether on CCTV, or streaming on Weibo, saw China knocking on the doors of Chang’E’s Palace. I hope that this, and future generations of Chinese artists, writers, and film makers, will be inspired in the way that the Apollo missions inspired Western creators, and perhaps this is the immortality that Chang’E has attained.